Cryptanalyst Marc Stevens from the Centrum Wiskunde & Informatica (CWI) in Amsterdam published on 15 August open source software that can detect and block forged digital signatures: CWI's hash collision detection library. CWI researchers Steven Pemberton, Marc Stevens and Robbert de Haan will give four lectures at the OHM conference, which takes place from 31 July to 4 August 2013 in Geestmerambacht, the Netherlands. 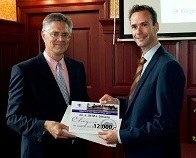 CWI cryptanalyst Marc Stevens won the Martinus van Marum Prize 2013. Cryptographer Ronald Cramer is elected as a Member of the Royal Netherlands Academy of Arts and Sciences (KNAW).